Morocco has vehemently criticized the UN Secretary General Ban Ki-Moon for his aberrant missteps and blatant bias in the Western Sahara issue, as evidenced in the statements he made during his visit in the Tindouf camps and in Algiers over the past weekend. In a statement released Tuesday evening, the Moroccan Government noted with “great amazement Ban Ki-moon’s verbal blunder, fait accompli and unjustified complacent gestures” during his recent visit to the region. 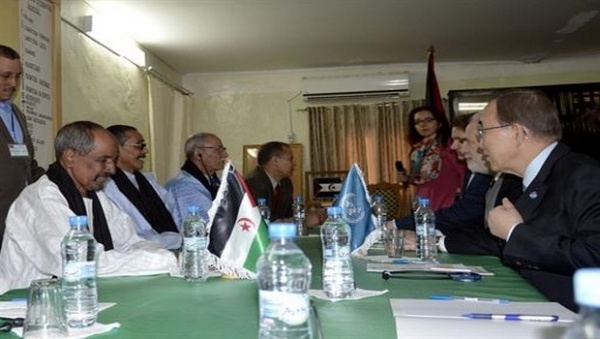 The statement decried the juxtaposition of the UN banner and the banner of the ghostly Sahrawi republic “SADR” on the table that gathered Ban Ki-moon and Polisario leaders in Tindouf and the use by the UN chief of the phraseology “occupied Western Sahara” in his statements to the media in Tindouf and Algiers. For the Moroccan Government, through such behavior, the UN General Secretariat “has abandoned its neutrality, objectivity and impartiality, and openly displayed a shameful indulgence towards a puppet state, which does not fulfil the characteristics of a State, has no territory, no population and no recognized flag,” at a time it knows that the so-called “SADR” has never, ever been recognized by the United Nations as a state. “These outrageous phrases hurt the feelings of the whole Moroccan people,” the statement said, adding that the UN Secretary General “has unfortunately accepted to be manipulated to give credit to spurious claims”. “This kind of semantic misstep undermines, in a dangerous way, the credibility of the United Nations General Secretariat…But let’s hope, in the interest of the UN facilitation process, that it was just a slip of the tongue,” the Moroccan Government statement said. Thus, Ban Ki-Moon has not only done nothing to revive the settlement process of the Sahara issue, but has demonstrated a flagrant bias in the territorial dispute between Morocco and Algeria, a fact that can only worsen the situation in the whole region.